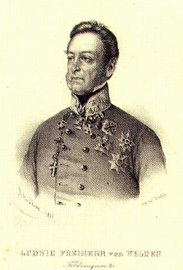 Weldenia candida (Commelinaceae) is named in honour of Baron Ludwig von Welden (1780 = 1853), Master of Ordnance in the Austrian army. 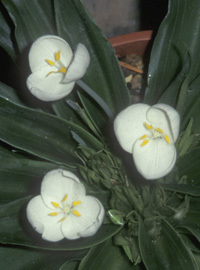 It was found in the crater of the Volcan de Agua, Guatemala, from where it was introduced to cultivation at Kew in 1893. When we first saw this gorgeous plant in Harold McBride's Alpine house, some years ago - we gasped at its exquisite beauty, and knew that it was 'a plant to die for'. On purchasing it from an English nursery, we have continued to enjoy its fleeting 'visit' each May and June. The flowers are very short-lived, and open only in sunshine. 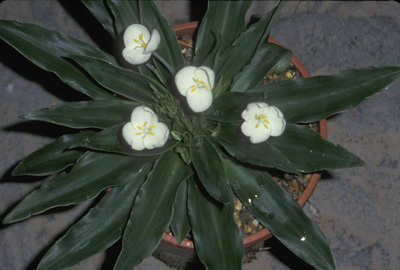 We grow Weldenia in the Alpine house in long tom clay pots which the fleshy tuberous roots seem to appreciate. Annually from these roots appear strong tufts of thick, pointed leaves and from the centre of the rosette rise short erect scapes of pristine white chalice-shaped flowers, with prominent yellow stamens. The plant is grown in a mixture of equal parts loam, leaf mould and grit - well watered during growth - but kept on the dry side during dormancy.